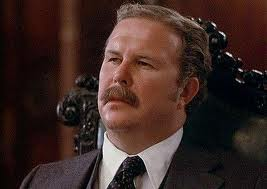 Ned Beatty as "Arthur Jensen"
On July 4, 2011, comedian Conan O’Brian picked the movie Network (1976) as the feature film for Turner Classic Movies. It has been lauded as a prefiguration of “reality television” (and, I gather, a major cause of the dumbing down of American and world culture). This was probably the third time I had seen the movie, but the first time that it bothered me as a counter-culture and antimodern script, following a strong tendency in post-WW2 America to blame the rise of Nazism on mass culture and its susceptibility to technological advances—advances that only enhanced the power of demagogues such as Hitler and Mussolini—themselves the stooges of hidebound big industry/ finance capital. I was particularly interested in the naming of the movie’s arch-villain “Arthur Jensen” for that is the name of a geneticist who, it is said, is a downright white supremacist, along with a cohort that includes Richard Herrnstein, J. Philippe Rushton, Charles Murray, and others who aroused the ire of the Left and New Left. Since Jensen’s work was already known and controverted in the 1960s and 1970s by such left or liberal luminaries as Harvard professors Stephen Jay Gould and Richard Lowentin , I gather that the name selected for the head of the mega-corporation that controlled the fictional network in the movie, was no accident. Moreover, “Arthur Jensen” invites “Howard Beale” into a conference room that Jensen describes as “Valhalla.” The connection between Nazism and globalization could not have been made more clear. Although Network was released decades ago, its analysis of the decline of our political culture, particularly the destruction of the individual as a human being, may remain timely. One aspiring academic (a Ph.D. Candidate in American Studies and Film Studies has called for papers at an upcoming conference titled “On Television.” Here is the call for papers as issued by Claudia Calhoun at Yale U. It was posted on the Humanities Net for American Studies. description of viewing behavior, a set of technologies, a media industry, and a means for collective social experiences. Both technological platform and cultural form, television sits at the intersection of a number of humanities and social science disciplines. As observers of — and participants in — this contemporary moment, we are compelled to ask: What makes television television? This conference will address contemporary trends in the field of television studies and reconsider the historical currents that inform our understandings of the present and prospective future of the medium. It would not be surprising if the same generational angst that produced Network, will be visible in some of the papers accepted for the Yale conference. If so, we can expect the same dim view that Schulberg and Chayefsky took of the new dehumanizing techniques that (racist) global corporations had inflicted upon an unwary public mind, defeating true artists such as themselves–always looking out for the little guy. “As for those artists who once were reds in the 1930s, many of them shifted to populism/progressivism when they saw that the Communist Party wanted to control their work. Budd Schulberg and Elia Kazan, both anathematized for “naming names” are two examples. I was particularly disturbed by their film, A Face in the Crowd (1957), that pinned fascism on the media-worshipping mass audience that had elevated the loutish “Lonesome Rhodes,” whose meteoric career had been aided and abetted by a female sentimental liberal–a stand-in for the moral mother, perhaps the figure who had driven them into the arms of the 1930s authoritarian Left. In other words, though Schulberg and Kazan professed themselves to be progressives, they replicated the aristocratic explanation for fascism as “the revolt of the masses,” bamboozled by the new mass media (radio and television), and shadowed by anti-progressive old money, particularly as embodied in immoral and hidebound Southern politicians. For a New York Public Library short biography of Chayefsky, see http://www.nypl.org/sites/default/files/archivalcollections/pdf/thechaye.pdf.